What are these wonderfully strange creatures I see popping up from time to time? they are what is commonly known as the Amigurumi, they start their life form off in the minds of their creator and are birthed through either Crochet or Knitting. They are traditionally made with Yarn. Acrylic Yarn is the cheapest and best to use if you are new to this craft, it also has it's advantage over wool in that it doesn't stretch, and you will not find as many holes when it comes to stuffing them. 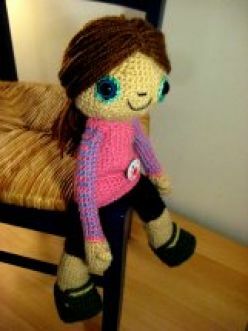 Many Amigurumi Doll makers would say that wool is the traditional yarn to use, and unlike Acrylic you are able to dye Wool to the colour you need. You can see an example of how the creations are made in the You Tube Link at the bottom of this Article. The word Amigurumi is derived from two Japanese words Ami which means knitted or crochet and Nuigurumi which means stuffed Doll. 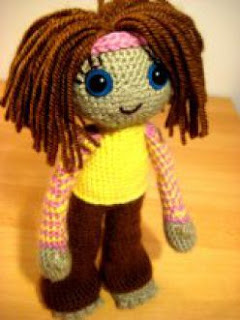 The dolls are produced in the form of animals or creatures that have evolved from the imagination, if you are itching to have a go at making one and stuck for ideas about what to make there are lots of Amigurumi patterns on the internet available for purchase try searching Ebay or Amazon. I wanted to get behind the workings of the mind of one of these Amigurumi Crafters, so I decided to do an Interview with a Gal who goes by the name of Out of the Frame and she also made the above Amigurumnis. 1. What inspired you to start making Amigurumis? I have liked making things since I was a little kid. My Mum is very creative and can make pretty much anything from a cardboard box! So me and my sister had great fun as kids creating stuff and playing with stuff she had created. My grandma was an artist, a painter, and also a genius at knitting and crochet. She taught me when I was young but I didn’t get into it enough to do it for my own enjoyment! We moved to Bosnia Herzegovina in September last year and at the church we go to there are some really lovely old ladies who have a knitting and crocheting club. They make loads of stuff like socks and table cloths stuff like that, not really cool, kind of granny style! but I was impressed by their creativity and I decided that I wanted to remember how to crochet and to make some cool stuff so I googled ‘cool crochet’ or something like that! and found out about amigurumi. I have been into cute Japanese things for a long time so when I found out about amigurumi I became hooked pretty quickly. I’ve only been doing it since March this year. Kawaii – I love cute Japanese things. Hello Kitty and Cinnamoroll are my favourite characters. I read some kawaii blogs, my favourite one is www.supercutekawaii.com and I look on google images and flickr for Kawaii things to get ideas and inspiration! After learning a few things online I bought a book called Amigurumi Super Happy Crochet Cute by Elisabeth Doherty so this book has influenced me a lot. She has a flickr account gourmetamigurumi where you can see loads of dolls she has made and they are amazing. She is definitely my favourite amigurumi artist. 3. where do you sell them i.e any places other than etsy? So far I only sell on etsy. I have talked with a friend about setting up a stall in the tourist part of town during the summer – Mostar has an ‘old town’ or Stari Grad as it is called here, which is very famous and loads of tourists visit in the summer. There isn’t a culture of craft fairs or events for artists or anything like that here. 4. any funny stories to tell about them or you making them? There is only one sewing shop in Mostar that I have found, so when I started to make amigurumis I went there to buy crochet hooks and wool. Then I needed stuffing. I couldn’t see any in the shop so I went home and looked in the dictionary for how to say stuffing in Bosnian or Croatian, found the word and went back to the shop all prepared with the sentence I needed to ask for stuffing, but what I didn’t realise was that the word I used was the word for the kind of stuffing you put in a chicken, not what you put in a doll! The shop man looked at me strangely and asked me why I wanted it, and I said for dolls! He must have thought I was really strange! anyway, eventually he understood what I was asking for, but all they sell here is chopped up bits of crumbly foam which is really not very nice so after all that I didn’t buy any. 5. what yarn do you use and which do you prefer? so like I said, in Mostar I have only found one shop that sells yarn and they pretty much only stock one brand! Nakolen. So mostly I use that. My mum sent me some eyelash yarn for my birthday which is made by Sidar 'Sidar Funky Fur and Sidar Boa'. The funky fur is great for making hair, and the boa for making fluffy jumpers. Getting hold of materials is hard here, you can’t even buy polyester stuffing so my Mum sends me stuffing or if people come out to visit they bring it with them. The eyes I use mostly come from enamieyes.etsy.com so I get them sent to UK and then Matt’s mum posts them to me! 6. do you knit or crochet? can you explain some of your process? 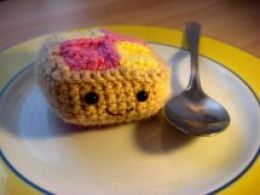 I crochet: amigurumi crochet is worked in unjoined rounds and mostly uses chain stitch, slip stitch, single crochet, half double crochet and double crochet. If you know those stitches you can make pretty much anything! You start by crocheting in a ring and then increase your stitches out from that – and then at some point decrease them! changing colour when necessary. It is actually really simple. 8. do you have an art training background? No – I did art GCSE but that doesn’t really count I guess my training came from my Mum and Grandma who encouraged me to be creative all my life. 9. what do you do as a profession? explain a little about your work role? I am a youth worker. I studied youth work at Brighton university and I have worked as a youth worker for West Sussex County Council and as a youth and community worker for Kingdom Faith Church. Now me and my husband Matt live in Mostar, Bosnia Herzegovina where we are team leaders for a Christian NGO youth work organisation called Novi Most International. www.novimost.org Bosnia Herzegovina is a country recovering from a civil war in 1992-1995. We run a youth centre here in Mostar providing a safe place for young people to come and make friends, have fun and learn new things. We offer courses in English , Guitar, Drums and computers and have a general youth club as well. We do a lot of arty things with the young people, encouraging them to be creative and giving them opportunities they wouldn’t otherwise have. The most important thing about our youth centre is that it is open to all young people in the city regardless of their ethnic background, it is place where they can make friends they wouldn’t make anywhere else – pretty much everything else in the city is divided – schools, shops, residential areas, so people from different ethnic backgrounds don’t mix and the prejudices continue. In our youth centre young people can mix with each other and see that all people are valuable and important no matter what their background is and so in some way we are working to bring peace and reconciliation to the city. 11. what character do you favour the most out of the ones you have created, and what character ideas do you have for the future? I think at the moment my favourites are Penelope, Senka and Mr Batten Burg. I am really happy with how Animal turned out – but he is not an original idea of mine obviously. At the moment I’m working on making some smaller amigurumis because they are quicker and that way I can get more stuff in my shop. Life is very busy so it takes a couple of weeks for me to finish one of the big dolls. I do have a big doll on the go as well, I am planning to sew some clothes for her instead of the clothes being part of the doll, but not sure how that will turn out! an experiment. 12. do you sketch your designs first? what creative process do you use? No I don’t sketch them. Sometimes I start with a colour scheme and see what comes out of it, like I get 4 balls of wool and decide those are the ones I’m going to use. If I’m making something for someone I try to put something of their character into the doll. Sometimes I get an idea from a cute picture I’ve seen somewhere. Often I just start making a head and then think about what colour eyes I want to use, then what kind of hair and then once the face is done, the rest comes from that. 12. do you have an ideal way of working, i.e do you work from chaos to order or the other way around? I think I work from the unknown to the known! or by bringing the subconscious into the conscious or something! I start with very vague ideas and see what happens, the more I do the clearer I am about what I want the finished doll to look like.